I have not had much time to write on the Blog recently. London Olympics are approaching fast and there are too many things to do and too little time! I have downloaded and used the software for few days now, and it has been very easy to create specific folders and import PDF files arranging my references by topics. 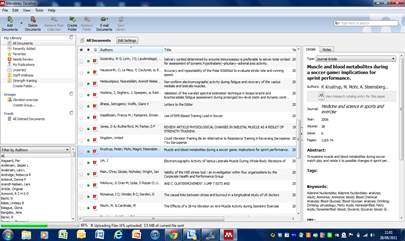 The folder syncs with server space, so it is possible to keep all the documents and libraries if your computer crashes or if you lose it, as well as push the content to other devices. 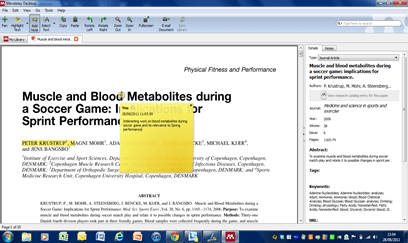 It is also possible to annotate, highlight and share comments with others. Also, it is possible to create shared libraries so everyone can add and share comments as well as share the PDF contents. Finally, it is possible to create an online group to share knowledge on a particular area. A great tool for anyone to use. The free version provides 500MB of space free and 500MB to be shared as well as the possibility to have 5 private groups ad 10 users. More space and more options are available for reasonable fees.